Geri receiving her Most Influential Filipina Women in the World Award™ at the #FWNSummit2017 (L-R): Global FWN100™ Selection Committee Chair HON Thelma Boac, FWN President Susie Quesada, Geri Alumit Zeldes (Global FWN100™ '17), FWN Founder & CEO Marily Mondejar, FWN Board Chair Maria Beebe, Ph.D.
Geri Alumit Zeldes (Global FWN100™ '17) attended the 14th Filipina Leadership Global Summit in Toronto, Canada this October and she did not return to the U.S. empty-handed. The Journalism professor received a “100 Most Influential Filipina Women in the World Award” in the category of Innovator and Thought Leader. 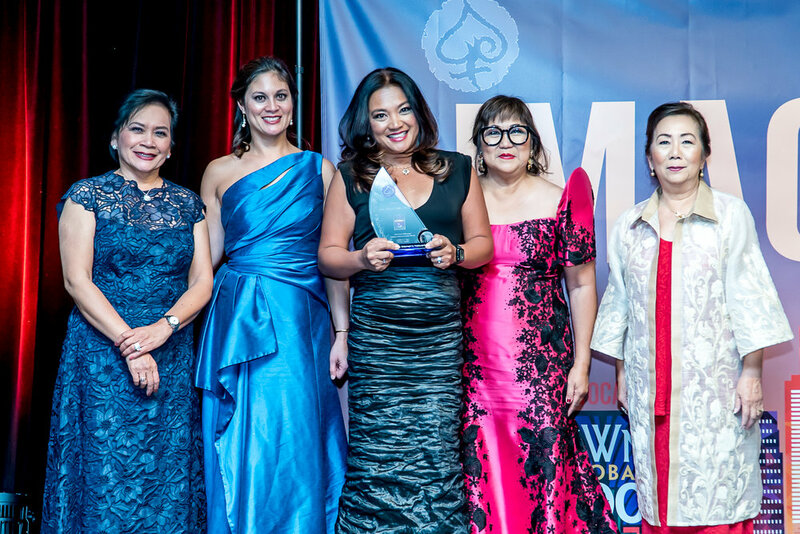 The awards were given to “fearless, passionate, purpose-driven, socially conscious Filipina women who are making an impressive impact in society.” Zeldes is nothing if not the embodiment of all of those traits. In addition to this award, she also brought in her third regional Emmy this year, as well as a regional Edward R. Murrow Award for a radio series on the Flint water crisis and a national award from the Broadcast Education Association for “Hubert: His Story,” a documentary about a Flint resident who uses his story and history to mentor youth in the city. Zeldes was not the only impressive woman at the summit. She said the recipient bios read like a “Guinness Book of Firsts”. Those honored in her category also included two surgeons from Manila who introduced robotic technology and specialized surgical techniques to the Philippines, and another woman who innovated an agricultural method adopted in orchards throughout the country. Though Filipinas came from all over the world to attend the summit and receive awards, Zeldes was able to seamlessly connect with the other women. “Sharing a common history of immigration allowed summit attendees to skip that layer and drill down quickly into issues that inhibit leadership, such as the tendency of Filipinas to stay silent in circles of political and economic conversations,” said Zeldes. Despite the scope of the Filipina Women’s Network, she noted that the event hinted at something much more close-knit.